It’s been a long time since we got behind the wheel of our car and headed out on the open road – instead of to the airport – for a travel getaway. But autumn came upon us, and the thoughts of a foliage tour took over our good sense and we headed toward northern New England. 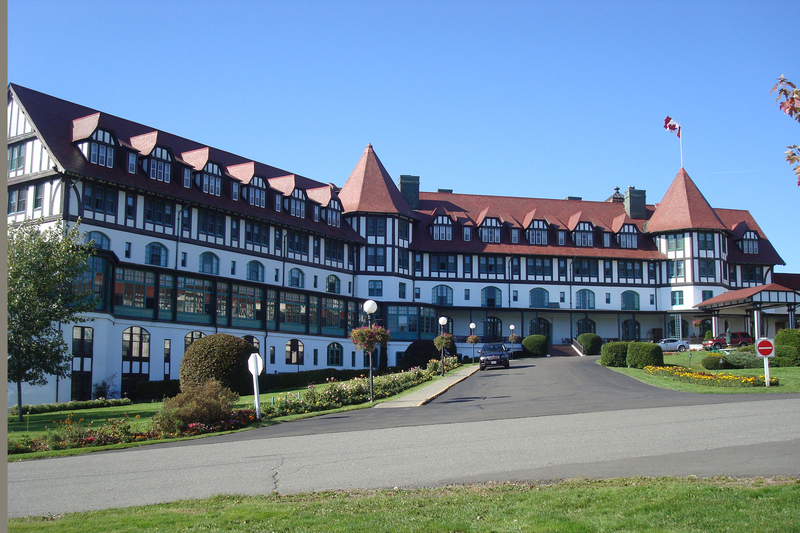 Along the way we stopped in St. Andrews-by-the Sea in New Brunswick, home to one of the grand dames of Canadian hotels: the Fairmont Algonquin. Originally opened in 1889, the Algonquin Hotel was one of Canada’s first resort hotels. Built by American businessmen, it was taken over by the Canadian Pacific Railway in 1903. The hotel eventually made its way into the hands of the New Brunswick provincial government in 1984. The Fairmont Hotel group currently runs the hotel (and has for a number of years); however, that relationship comes to an end on December 31, 2011. Our recent stay there provided us with several clues to the answer to our question: why is Fairmont not renewing its contract to run the historic property? We might be wrong, but we’d have to wager a guess that it has something to do with the Fairmont brand and that this property doesn’t live up to the brand expectations of its clientele. These discerning travelers booked themselves into what is called a medium suite located in the main historic building. The two-room suite was quaint as expected (although not the kind of décor we are usually drawn to), furnished with what appeared to us to be either antiques or cast-offs from an estate sale. Although everything was sparkling clean, when Art walked out of the bathroom for the first time he said, “If Ian [our 22-year-old son] rented an apartment with a bathroom like that, we’d think he lived in a slum.” It had not had benefit of a renovation in at least 40 years. Need we say more? 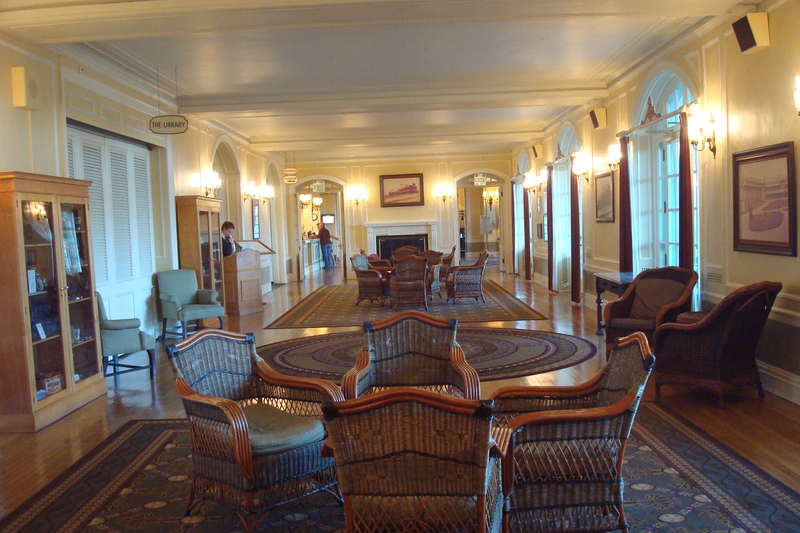 The main rooms of the hotel and the grounds evoke a sense of eras past when travel was more leisurely, and activities to while away the time were more gentile: reading, strolling, sitting in Adirondack chairs in front of wood fires in the evening. The real highlight of the stay was our anniversary dinner at the hotel’s main dining room, The Library. The day happened to be Canadian Thanksgiving and the chef was offering his version of the traditional turkey dinner, finished off by pumpkin crème brulée that was exquisite and worth every last calorie. What will happen to the hotel after the Fairmont folks pull out is anyone’s guess. We did ask several employees who indicated that it will definitely remain open, but there was no word on who would be managing it. We only hope that the new operator has deep pockets, because this fading lady will fade off the radar of discerning travelers everywhere without the makeover she so desperately needs – and deserves. 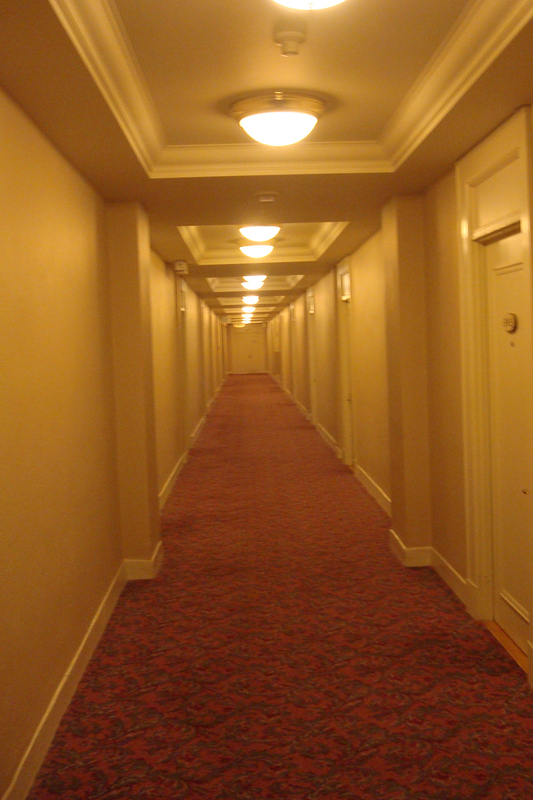 The creepy corridor: Like a scene right out of "The Shining"